What is the procedure to change email account which you want to use to make in-app purchase? I am using 2 Gmail accounts and only 1 has a credit card attached. The primary account has a credit card, the secondary does not. But my secondary account is always in the payment dialogue. The secondary account is also not the account used in Play Store app. I found no way to change this email. Uninstall the app on the phone. Go to the Play Store site in your web browser and find the app. Make sure you're logged into the website with the right account! Install the app through the Play Store by clicking on ‘Install’ button (and selecting your phone). Wait a minute until the app is installed on your device. I was having the same problem, and all the other answers didn't solve the problem. However I figure a solution to solve the problem. Please note this works specifically for games, but I have a theory near the end that it will then allow you install apps with the right account. The problem lies with what account the downloaded and installed application is associated with. To check which account it is, go to the play store, switch to the account you expect it to be in and then go to the "My Apps & Games". Then pick the secondary tab "All". If the game doesn't appear in this list, then this is the reason you are having a problem. Keep switching accounts and you will eventually find which account it is associated with. First you need to uninstall the game. Then you need to remove the game from the account that it is associated with. You do this by doing the same steps as above for checking, then afterwards you need to press the cross ("x") button in the top-right corner to remove it. 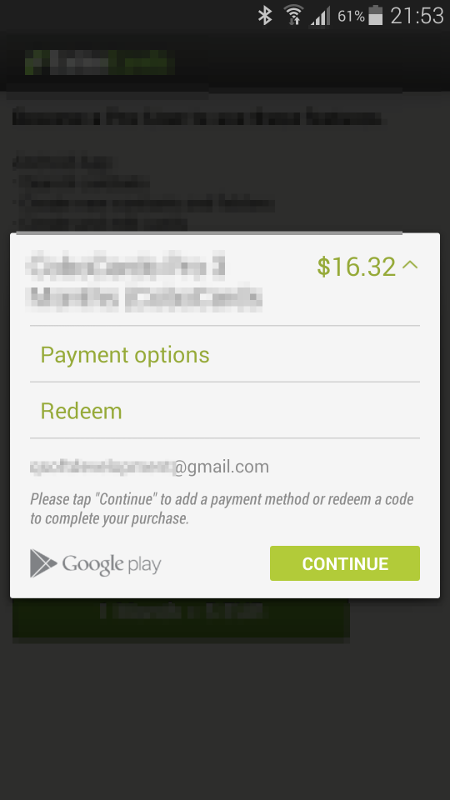 Open (or download, install then open) the Google Play Games app. Make sure you are logged into the correct account (on both Google Play Games and Google Play Store) you want the game to be associated with by using the hamburger menu on the top-left. Find the game you want to play, and then click on the store button (normally the button would read open if it was already installed). The steps above seem to force the play store to make sure it associates the game with the right account. I have a theory that after you have done the steps above, you can then search for a regular application and install it and it should be associated with the same account... and will then allow you to do in-app purchases too. I haven't tested this however, since I only needed it to work for games - so feel free to leave comments if my theory is correct. 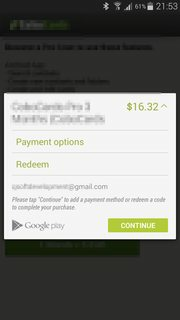 You should now be able to purchase apps using the proper account. I am assuming that you want to switch to your secondary email account in all your apps, which means removing your primary account permanently from the phone (though you can add it later again). In KitKat, if you want to switch to your secondary email, in all of your apps, you need to remove the primary email account from phone. Go to Settings -> Accounts -> (your primary account) Now tap on options button, and select remove account. Reboot the phone, so that the primary account gets removed from all your accounts. If you don't want to remove your primary account, and you want to switch to your secondary account only in Google play app, see the other answers. Not the answer you're looking for? Browse other questions tagged google-play-store 4.4-kitkat in-app-purchase or ask your own question. Can I change my payment account? 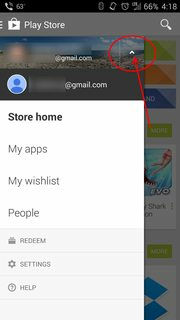 How do multiple accounts on Play Store work? How to change the Play Store language?